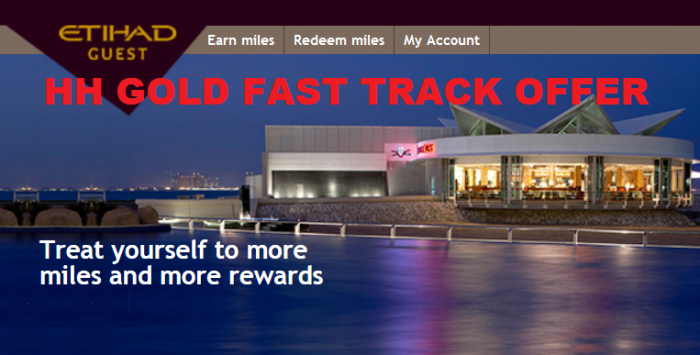 Hilton HHonors has now extended the Gold fast track offer for Etihad Guest members as well that comes with instant Gold status. All you need to do is to register for this instant Gold that is valid until October 31, 2015, and have three stays during the period to keep it through March 2017. Note that there is no landing page for this offer on Hilton.com. You can access web page for status related benefits here. You can also earn double miles for your second stay, triple miles for your third stays and quadruple miles for your fourth stay during the promo period. Note that you must have your Hilton HHonors Double Dip option set to Points + Miles and have Etihad Guest selected as the preferred partner. There must be soon close to ten airlines with whom Hilton has this same offer going on. All the other offers are targeted besides the Airberlin one that you can read more about here. I have considered the Hilton HHonors Gold to be the most valuable of the mid status levels that comes with complimentary breakfast and/or lounge access, room upgrades and bonus points. Offer valid for the recipient of this email only and is non-transferable. Etihad Guest member who enrols in the Hilton HHonors™ Program and registers for the Hilton HHonors Trial Gold offer by 31st October, 2015 will receive HHonors Gold status until 31st October, 2015. If an existing HHonors Diamond Elite member registers for the promotion, your status will change to Gold; in that case, please contact HHonors Customer Care at hhonors@hilton.com or by dialing T: +1-800-584-8690 to have your Diamond status reinstated. Please quote the Hilton HHonors Trial Gold Offer’. Recipients may receive offer emails from multiple airlines, however, only the first enrolment will be valid with HHonors and all subsequent enrolments will be void. To receive HHonors Gold status through 31st March, 2017, complete three stays between 7th July and 31st October, 2015 (“the Promotion Period”). Newly enrolled HHonors members’ Preferred Travel Partner will be set to the airline partner enrolled through and the Double Dip® Earning Style Option will be set to Points & Miles™. Existing HHonors members must, prior to the stay: (1) select [insert airline partner name] as their preferred Double Dip® Points & Miles™ partner in their HHonors profile; (2) select Points and Miles™ as their Double Dip® Earning Style within their HHonors profile; (3) register for the Etihad Guest promotion. Bonus Etihad Guest Miles: In addition to the Hilton HHonors Gold Status, Members will earn the following miles with Etihad Airways on stays completed during the Promotional Period: 2nd stay – double bonus miles, 3rd stay – triple bonus miles and 4th stay – quadruple miles. A ‘stay’ is defined as the total number of consecutive nights spent at the same hotel, whether or not a guest checks out and checks back in again. Please allow six to eight weeks from completion of your stay for miles to appear in your HHonors account. Standard requirements must be met to maintain Gold status after its expiration under this offer.